Christmas 2009 via the SOS iPhone source. This theme contains 32 icons, a dock and a wallpaper. Simple Christmas via the iSpazio source. This theme contains 39 icons, a dock and a wallpaper. In order for this theme to look exactly correct, you will need to ssh into the Library/Themes/Simple Christmas/Icons folder and rename the Text.png icon to Messages.png. 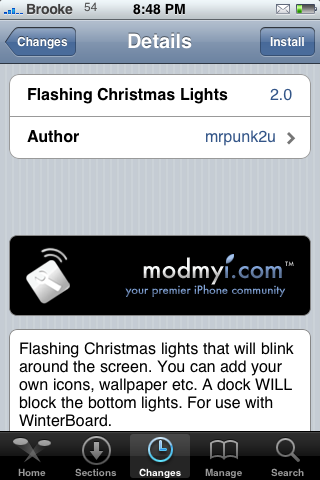 Ryan Cawns Christmas via the modmyi source. This theme contains 32 icons, wallpaper, dock, UI sounds, lock screen background, iPod controls mod… etc. There is one icon that needs to be renamed in this theme. You will need to ssh into the Library/Themes/Ryan Cawns’ Christmas Theme/Icons folder and rename the Music.png icon to iPod.png. iStorm Xmas via the BigBoss source. This is a Christmas version of the original iStorm theme. This theme does take a little bit of set-up. You will have to add four blank icons to the top row of your SpringBoard. Also, you will need to ssh into the Library/Themes/iStorm Xmas/Icons folder and rename the Text.png icon to Messages.png. Flashing Christmas Lights via the modmyi source. This mod adds a string of Christmas lights around your icons. It does not mod your icons so, you are basically supposed to use it in conjunction with another theme. The string of lights will randomly flash in different patterns. In order for the theme to look exactly right, you will want to enable the Transparent Dock via WinterBoard. Let It Snow Widget via the SOSiPhone source. This hack for the iPhone makes it snow behind your icons and above your wallpaper. It is downloaded in Cydia and activated by Winterboard. Snow falling in my iPhone! I’m downloading now… Thanks for the tip! I wish someone would make a xmas inav theme! Any christmas batteries out there???? Anyone knows the name of the theme used in Flashing Christmas Lights screenshots? Does anyone know if the Flashing Lights will drain the battery faster when on the home screen?